Theresa Singleton writes, “The archaeological study of African-American life has become a well established research interest within American historical archaeology” (1999a, 1). This position, well accepted across the United States, takes on a different meaning when it is considered from other places on the continent. For example, in Argentina, not more than two or three archaeologists have demonstrated interest in the subject in spite of the importance that this topic should have. This fact has a negative repercussion in the national archaeological community. Is this a simple delay in the national research lines? I believe not. I believe it is due to racist attitudes within academia and due to the views and understanding of the role of archaeology in society. Let us take another example: the bibliographical compilation The Archaeology of the African Diaspora in the Americas (Singleton and Bograd 1995), which does not have a single reference on Argentina. Is this the authors’ mistake? No, there was not a single reference on this subject in Argentina back in 1995. The archaeology of African Argentina is at its very beginning stage. Not a single book has ever been published on this subject, and only some papers have dealt with the topic. On the other hand, the history of the African population in Argentina has experienced some growth and, from the 1980s, there has been an increase of publications and studies, including some recent books (Coria 1997; Morrone 1995; Picotti 1998) and an extensive list of researchers such as Ricardo Rodríguez Molas (1955, 1958, 1959, 1961, 1962, 1969, 1993), Marta Goldberg (1976, 1994, 1997, 2000), Silvia Mallo (1991, 1997), and Miguel Angel Rosal (1978, 1982, 1988, 1996), who followed the first academic studies by Diego Luis Molinari (1944), N. Ortiz Oderigo (1974), and Elena Studer (1958). From the public outreach point of view, the first publications on this topic were by Vicente Rossi (1925) and José Luis Lanuza (1946). The inmediate challenge facing the archaeologist of African Diaspora in Argentina is to fiad the earliest indications of the African presence in the country. Yet the denial of the existente of African Argentinean population in the past or in the present is so strong that in August 23, 2002, a woman was stopped at the Buenos Aires airport because “she couldn’t be Argentinean and black”. The indirect accusation here was either the passport was false or her skin color was fake (Clarín, 24-8-02, cover). This incident, with all the evidence of discrimination and racism it projects, shows the prevailing image of Buenos Aires as a white-only city whose seven million inhabitants are “white”, no matter what definition of “white” is used or what the reality shows. The contemporary racial makeup of Argentina was profoundly shaped by the large white immigration in the 1900s, and since then the African presence in the city has been denied. If we take the already exaggerated statistical figures, blacks do not even reach 0,2 percent of the total population. Nevertheless, when looking at the historical sources, we know that in the early nineteenth century there were towns and cities where the African population surpassed 50 percent, and at that time Buenos Aires was 30 percent black (Ravignani 1919). The rejection of this past visibility tics in well with the position taken by the traditional archaeology where the presence of the African population and their contribution to the making of Buenos Aires is rarely acknowledged. Yet it is through archaeological remains that we can assess the extent of African presence in the city. Granted, it is difficult to determine the ownership of an object or a group of objects to a specific ethnicity or social group. Many of the diagnostic artifacts that we assign to the African community can be ascribed to any poor population: Caucasian, Mestizo, or Native American. This subject of material culture and racial/ethnic identity arose in Buenos Aires when we were digging a garbage pit that belonged to the house of an important woman in Buenos Aires society during the mid-nineteenth century, Mrs. Josefa Ezcurra, located at 455 Alsina Street. She had many servants living in her basement at the end of the eighteenth century, and they were mostly Africans (Seró Mantero 2000). The objects found at this house were ascribed to an African origin. This discovery carne along with the uncovering of the first handmade ceramic pot, of about 12 cm in height, so common within the Diaspora context and so different from all the other Creole or Indigenous material culture. These findings opened the door to understanding the material culture of the African population in Argentina and how objects were deployed in daily lives to ensure individual and group survival. Unlike the plantation systems, it is impossible to dig slave quarters in Buenos Aires because slaves were part of the urban population and they lived in their masters’ homes. Therefore, there was only one other possibility: to be able to identify objects of African cultural provenance within the garbage produced by the residents of a large house, we also need to have a wide range of collection of artifacts from public and private settings, but with no archaeological context, for comparative purposes. Today, the Buenos Aires population shares mainly white European physical and cultural features, from both Western and Eastern Europe, and also Asia Minor features, due to the large immigration between 1880 and 1920. Today, the African presence is almost nonexistent, or at least it is not clearly visible. Buenos Aires was founded in 1580 after an initial failed attempt in 1536. It started as a poor village but soon became a major port city. The population from South America wanted to llave an easy access to the sea so they could communicate with Spain, but the great city of Lima and its trading monopoly made it impossible. Thus the role of Buenos Aires as a city was left in a second place until almost the end of the eighteenth century (Schávelzon 2000a). African slaves had to travel by the Magallanes Strait on the southern tip of the continent, and tiren sail up to the port of El Callao, later travel to Lima, where they would take a road trip of several months to reach the different exchange points, specially the silver mines of Potosí, which were the main buyers of slaves. 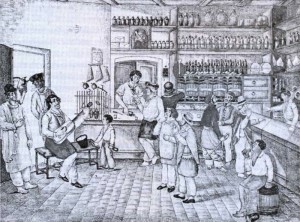 This system took a slave or any product almost a year to travel from Spain to Buenos Aires, and it increased incredibly the merchandise prices. In response to this problem, an illegal exchange system rapidly developed that brought produce, including silver from the Potosí mines, and slaves directly to Argentina thereby circumventing the official authorities (Crespi 2000; Moutoukias 1989). 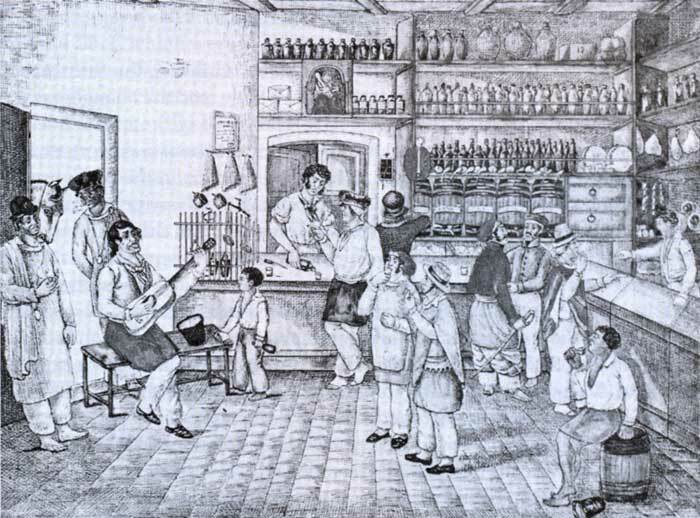 Thanks to these illegal market activities, the city of Buenos Aires was able to survive, and within two centuries it was able to overcome Lima in terms of regional power. The fact that most slaves entered Argentina illegally makes it difficult to know how mane Africans were forcefully brought to Argentina. Many details from this period have peen impossible to reconstruct: there are few written registries, and those that exist are inaccurate. However, the entry of 250,000 to 300,000 Africans is accepted among researchers (Curtin 1969; Studer 1958; Torre Revello 1979). For example, between 1606 and 1625, when Buenos Aires was only a remote village, 12,778 slaves were registered as entering the city, of which 11,262 had entered illegally but were detected by the authorities. The rapid depletion of Africans during the late nineteenth century is another problem that we face when conducting research. Slavery in Buenos Aires and its surrounding region was not devoted to working on plantations like in Brazil or in the Caribbean, nor was it for working in the mines like in Peru or Bolivia. Slaves raised cattle in the rural arcas and made handicrafts and worked in homes in urban centers. This made the living conditions different from those of plantation slaves. In Buenos Aires, there were no “Large Houses” where slaves were locked up at night, as was typical in Brazil. The Buenos Aires slaves enjoyed the benefits that the anonymous urban life offered, and the fact that they lived in the same houses as their masters would have enabled a large segment of the enslaved population to receive better treatment (Fig. 1). This fact possibly gave some of them access to better food and material goods, although with attached paternalistic attitudes from the masters of the house. Artisans from the city were sometimes able to have their own workshops and were even able to have some slaves under their command in exchange for paying their master a daily salary. During the nineteenth century, some employers allowed adult slaves to manufacture simple products, sell them, and pay back to the masters their daily salary (Andrews 1980). It is also a fact that there are few references to runaways and slave rebellions. The data from 1806 and 1807 show that there were 6650 “blacks and mulattos”, 347 natives, and 15,708 whites in Buenos Aires. These figures put the percentage of the African population at 26.20 percent. However, 13 percent of the population did not participate in the census, a high percentage of whom were probably of African descent. In 1810 there were 9,615 “blacks and mulattos”, 150 natives, and 22,793 whites, which means that the percentage had increased to 29.53 percent. However, the image that the travelers had of the city at that time was slightly different, since they calculated that the African population reached up to 50 percent of the residents, a situation similar to a place like Tucumán, which was 64 percent African during the same time period. Obviously, the census figures did not take into account the slaves in the “Companies” waiting to be sold or transferred, since they were merely objects. The urban houses could be large or small, but normally they sat on large lots. Depending on the owner’s social status, these houses range from a living room and a bedroom all the way to a dozen rooms. However, the place for the slaves was what has been called the “the patio at the bottom”, a place physically separated from the main house but without an absolute racial barrier. It is common to state in the nineteenth-century chronicles that white people had been raised by an African slave—or free servant— and played with the African children, but when the white kid reached puberty this situation abruptly carne to an end. In 1813, the first law was passed where they gave conditional freedom to the slaves’ children, although in Buenos Aires slavery did not completely end until 1861. The 1813 law that conditionally freed the slaves’ children, the British abolitionist activities in West Africa against the slave trade, and the changes taking place in Argentina between 1810 and 1816 as a result of the independence movement made the arrival of slave shipments less frequent and more expensive in the early nineteenth century. Most of the soldiers in the Argentinean independence movement were slaves who offered their service in exchange for potential freedom or who were simply taken away from their masters. The disruptions inflicted on the economic life by the wars of independence rapidly decreased the imports of human cargo into the country. Moreover, the death rates among the slaves was already high and the fact that a large percentage of the slaves who enrolled in the army never came back from the independence wars that took place in Chile, Peru, Bolivia, and Paraguay drastically decreased the number of slaves in Buenos Aires. Afterwards, Africans who lived close to the port area, who were without doubt the poorest population in the city, suffered several serious epidemics such as cholera and yellow fever, and these poor Africans descendants recorded a higher death rate among the population. Earlier in the 1860´s, the war against Paraguay killed hundreds of thousands of Africans who were almost exclusively the only members of the army troops —a true human genocide. All these facts reduced the number of Africans in Buenos Aires. Moreover, there was also a decrease in the life expectancy among these populations where there were no newcomers and the old residents were dying faster (Schávelzon 2003). However, other countries that suffered this same situation did not have their African population erased: something different had happened in Argentina. It was difficult to find an explanation for this abrupt reduction of the African population that took place in less than half a century. This situation turned out to be the sum of two phenomena: (1) Africans had a birth rate of only 1 percent (Goldberg 1997, 2000) and almost half of all infants died, and (2) the large group of non-African immigrants accounted for the “whitening” of the Argentinean population. At the turra of the twentieth century, more than one million Europeans and Asians entered Argentina. 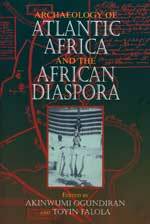 The international bibliography has identified a group of artifacts as characteristic to the African culture in the Diaspora. These artifacts have been documented severa] times in excavations, and although it has been impossible to identify who used them, the fact that they appeared in excavations is a first step for the studies on this topic. Some of the most important artifacts are ceramic pipes (Fig. 2). There are many shapes, but all are small, made of a dark ceramic paste, without a tube, and with an enlargement in the mouthpiece. They have star-shaped decorations, triangles, crosses, or arcas decorated with dots and lines, which were well-known decorative motifs from West and West Central Africa (Schávelzon 2003). Round colored stones were found, together with glass pieces or some other objects that were slightly altered or polished and that apparently were used in divination ceremonies. There are also ceramic pots or containers less than 15 cm tall, handmade, irregular, with fingerprints on their surface (Fig. 3). There is nothing similar to these artifacts in the European or local indigenous collections. In other regions, like Santa Fe la Vieja (1560-1650), human heads with African features made of coarse clay have been identified. In nearby arcas, such as Arroyo de Leyes, some human figures or containers depicting deformed human and animal heads were found at a cemetery (Aparicio 1937; Bousquet 1936). 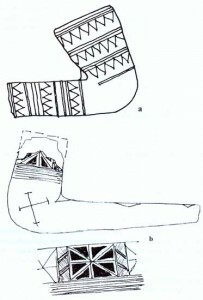 These figures were similar in style to what was found at sites dating to the nineteenth century in the southeastern United States (Burrison 1978; Vlach 1990). On at least one occasion at Buenos Aires, a handmade wooden figure was found buried in the shore of a small artificial lake, with a noose around its neck and a thorn made out of bone in its heart (Schávelzon 2003, 148). There are a wide variety of objects that, thanks to the written sources, have been identified as belonging to the African population. For example, the wooden swords (sables de palo) were worn with ceremonial outfits. The so-called king of each nation (congregation) was expected to own one, since they were forbidden to carry real weapons. Pieces of these swords have been found at least twice in domestic trash pits in the southern area of the city where the African community used to live in the nineteenth century, especially associated with the libertos (those slaves who were able to run their own businesses). Several types of archaeological contexts are associated with the African population, but the most common are trash pits and the living quarters. A combination of the two contexts has been found at 455 Alsina Street, the house that belonged to Mrs. Josefa Ezcurra. According to the written sources, the trash pit dates from 1801. We found a ceramic pipe decorated with white dots incide triangle motifs, a knife mide from a cow rib, polished stones, exquisite carved glass from Spain, magnificent creamware pottery, and an almost complete Talavera píate set. It is possible that all the trash, from the masters and the slaves, ended up in the same trash pit. When excavating under the floors of the servants quarter, we found irregular ceramic disks of different sizes (Fig. 4), a modeled dark ceramic pipe without decoration, and blue glass beads (Schávelzon 2003, 145-50). A completely different situation was found in the trash pit of the Santo Domingo church, dated to 1780-1820, where a group of six fragments of bone objects were found, including a fan handle (Fig. 5), thrown together into the trash pit, probably wrapped up in a leather bag. However, the rough conditions inside the pit have made this hypothesis hard to prove. The priests from this church and from the other Catholic Orders from this city had a large number of slaves living in specific buildings in the south crea of the convent (Schávelzon and Silveira 1998). Could we identify this as a group of objects used for divination ceremonies? We find a similar case while excavating under the house on Alsina Street where, in the last patio, a group of objects was found, each less than a centimeter in height, some made from a well-cut piece of a kaolin pipe, some from two blue necklace beads, and some from two copper pieces, one of them possibly a button (Fig. 6). We think that some African slaves used such objects for ceremonial or divination activities (MacGaffey 1987). The third category is that of the nonarchaeological discoveries which nonetheless have partly preserved their context and for which we have at least one source, whether oral or written, that identifies their owners. There is a house in the southern end of the city that still had an oral tradition preserved by its owners about how some objects that belonged to a king from the African Nation had been thrown into its well. This king (a direct ancestor of the house owners) played an important role until 1852, during the government of Juan Manuel de Rosas. He became important because he politically supported the African community, and when he was murdered his family threw all his belongings finto the well. When the house was toro down, the owners cleaned the remains from the well and the objects that were found dated to the 1850s, clearly related to the Rosas political power: an army shield, flags, banners with inscriptions, and a snake-shaped wooden scepter. We know from the chronicles that this was the type of scepter used during the dances to determine the rhythm of the group, and it could only be used by the ceremony’s leader. during one of the river modifications. This is a ceramic pipe with a very mestizo shape, and hundreds of such pipes have been found in the city of Santa Fe La Vieja (Teresa Carrara and Nelly de Grandis, pers. comm. 2000). 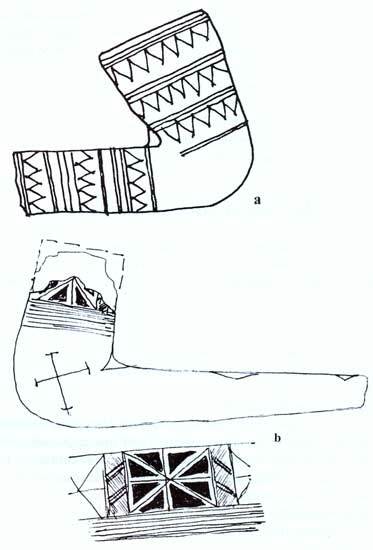 This is the only pipe that has been located outside the Santa Fe’s context with the engraving of the classic BaKongo symbol. At least one other dark gray ceramic pipe that comes from a nineteenth-century landfill shows a similar though more abstract symbol. This symbol was applied to the exterior of the pipe and was excavated at Defensa #751 street, the landfill area of the city. In 1996 and 1999, several excavations took place at the city square where we knew that a cemetery for poor people supported by the nearby Catholic church had existed during the eighteenth century. This was where abandoned slaves, suicide victims, unidentified bodies, or paupers were buried. Anyone who could not afford a funeral was buried there, no matter the skin color (Quatrín 2000). There was also a women’s hospital and a girls’ asylum at this location. The construction of these later buildings during the fineteenth century destroyed many of the graves. However, seventeen graves were archaeologically excavated (Techenski 2003). The materials that were found corresponded to different time periods and to different activities. These materials appeared mixed, but there were significant elements such as pipes and containers from the African culture. At least one burial did not belong to the Catholic tradition. Skeleton #17 was found in a flexed position, with the back slightly in a higher location and with a long necklace inside the mouth. We know from local chronicles and comparative archaeology of the African Diaspora that necklaces were a symbol of power among the dignitaries of the African Nations in the Americas (Stine, Cabak, and Groover 1996). A description dating to this period says that the king of one of the communities “preserves as valuable relics two necklaces that may measure approximately three meters” (Gallardo n.d.). Although the skeletons from this cemetery are still being studied, they have already been identified as African (Zunilda Quatrín and Xavier Perussich, pers. comm. 2003). Although the archaeology of the African population in Buenos Aires is just starting to take its first steps, a few discoveries deserve being mentioned in this chapter. First, we have already accepted the existence of a past population that until now had not been taken into consideration. Whether this group is a social group, a social class, or a culture is a discussion that should be our concern in the future. Second, we accept that this group of people interacted in different ways with the other groups, maintained its cultural traditions from its original place in Africa, and created new ones. Third, archaeology is revealing aspects of African cultural life unknown in the written history until now, such as divination practices and religious ceremonies, and the existence of non-Catholic burials. The fact that we are finding African or African-inspired ceramic forms and stvles possiblv indicates that this African population maintained the African ways of cooking, eating, and planting vegetables (Schávelzon 2000b). The preservation of these traditions by this population implies some sort of resistance that we are only beginning to identify and understand. The lack of evidence for slave rebellions in the city hid tbe other ways the Africans used to challenge their masters’ begemonic control and culture. This field of studies is finally open for inquiry with exciting possibilities of unexpected results. I appreciate the personal communications from Zunilda Quatrín and Xavier Perussich about their excavations in the Square Roberto Arlt and from Teresa Carrara and Nélida de Grandis about Santa Fe la Vieja. We also want to thank Theresa Singleton, David Webster, Verónica Aldazábal, and Editorial Emecé for allowing us to reference my book Buenos Aires Negra, and the CONICET, which has supported the research project on the African presence in Buenos Aires. Appreciations to Dr. Chantal Esquivias, research fellow in the Department of Archaeology, Boston University, for translating the original manuscript from Spanish into English.